Yep, I’m still waiting. My Cyber Monday package still hasn’t come yet! I have been waiting a while for it to come, almost for 2 weeks. Usually packages from AG come in less than a week, so I was getting pretty impatient. On Wednesday, my mom got an email from American Girl, that said, “Your order has shipped,” but it wasn’t my order. It was my sister’s. She bought Kit’s bed when it was on sale after I bought my items. So I asked my mom if she could search her email and see if there was an email saying my items had shipped. As she was searching, she discovered that she got an email from AG saying something different. It said something about my order being messed up, and it told us to call customer service within 10 days. She found the email on the 10th day. My mom called customer service and my order was still in their system. It would be ready to ship in a few days. I think my order is on its way. 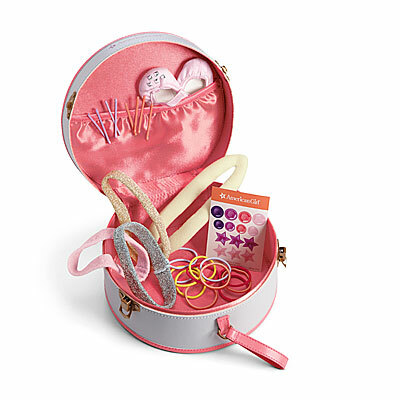 I bought the Dance Case for Kanani. Her birthday was on December 9th. Happy Birthday! She is okay with her gift being late. A late gift is better than no gift, right? 🙂 I also got something for Isabelle : The performance set. I hope your stuff is hear soon! When i got on AG the sale was all over:( I Isabelle for my bday and i want to get stuff for her before they do not have them her and her stuff anymore. That is a good idea. I think Isabelle has some of the best clothes and accessories! I would get the studio if it wasn’t so expensive. 😉 I doubt they will put it on sale.